With its bizarre claim to have been found in a surplus IBM copy machine in 1986 by a Boeing Aircraft employee, Silent Weapons for Quiet Wars takes its place among those dubious ‘elite blueprints’ for control of the planet, second only to the well known treatise The Protocols of Zion. Dated May 1979, Silent Weapons called for a “quiet revolution” through economic engineering, using such methods as economic shock testing and paper inductance/inflation (exchanging true value for inflated currency), and balancing the system by killing off the true creditors of this exchange (the public) in constant wars. Silent Weapons was first published for mass consumption by the late William Cooper in his 1991 underground sensation, Behold a Pale Horse. A few versions of this document also appeared later on the internet along with remarks to the effect that the paranoid manifesto was probably penned by Cooper himself. (1) Cooper, a former Naval Intelligence Officer with a purported 38-level above-top secret clearance, claimed to have read this report in a “Naval Intelligence Majority Twelve file,” and that it was authored by the Bilderberg Group. Cooper states in his book that it was given to him by someone named Tom Young. As far as I know, William Cooper was not a highly trained economist. Furthermore, if Cooper had written the document, why would he remove his own elaborate mathematical notations? Also, Cooper’s version does not contain the Preface that appears in the pamphlet (shown below). The Preface notes that the document is “reprinted in its virgin form, with diagrams” and is described as “heavy reading.” However, it is possible the pamphlet was printed after Cooper got hold of his version of the document. The reason for removing the diagrams (and any mention of them) might have been that Cooper thought them too obscure for the grassroots patriot movement that was his audience. In addition, by renaming the document, “The Illuminati’s Declaration of War on the American People,” Cooper emphasized his patriot leanings and de-emphasized the more complicated mathematical elements of the ‘Illuminati’ blueprint. The economic analyses implicated in Silent Weapons could only have been made by someone with an advanced understanding of complex social economic systems. In short, while I believe Cooper may have been capable of understanding the diagrams in the manifesto, I don’t believe he had the background to devise them. There are also other differences between the two versions: Cooper’s version of Silent Weapons reproduced in Pale Horse contained his characteristic ALL CAPS for emphasis. The original pamphlet does not contain these. Cooper’s version also inserts personal notes in brackets. We have not inserted Cooper’s personal notes. This version reproduces some of the diagrams missing from Cooper’s version. This rare and ambiguous document could very well be a hoax, but was it perpetrated by William Cooper or on William Cooper? If it’s a hoax, who wrote it? Could it have been written by Ted Kaczynski? Or perhaps the late anarcho-libertarian Murray Rothbard? Please send us your ideas. Conspiracy Theories are nothing new to history. Plots to kill Caesar and overthrow Rome abounded, for instance. However, it is seldom that concrete clues to such plots come to light, and are generally known. The document you are about to read is real. It is no forgery, as is alleged of “The Protocols of the Learned Elders of Zion,” or actual forgeries such as those of Anne Frank, or (more recently) Hitler’s diary. “TOP SECRET: Silent Weapons for Quiet Wars, An Introductory Programming Manual” was uncovered quite by accident on July 7, 1986 when an employee of Boeing Aircraft Co. purchased a surplus IBM copier for scrap parts at a sale, and discovered inside details of a plan, hatched in the embryonic days of the “Cold War,” which called for control of the masses through manipulation of industry, people’s pastimes, education and political leanings. It called for a quiet revolution, putting brother against brother, and diverting the public’s attention from what is really going on. For all intents and purposes, this document has “come to pass” much as Henry Ford, Sr. said that the Protocols (regardless of their veracity) applied to the events of his day. It is reprinted in its virgin form, with diagrams, as a touch of reality. It is heavy reading, but it will (as it should) spur you to read further, keep your eyes and ears open, and sound an alarm in Zion, for though she presently dwells with Babylon’s daughter (Micah 4), her redemption draweth nigh. This manual is in itself an analog declaration of intent. Such a writing must be secured from public scrutiny. Otherwise, it might be recognized as a technically formal declaration of domestic war. Furthermore, whenever any person or group of persons in a position of great power and without full knowledge and consent of the public, uses such knowledge and methodology for economic conquest – it must be understood that a state of domestic warfare exists between said person or group of persons and the public. The solution of today’s problems requires an approach which is ruthlessly candid, with no agonizing over religious, moral or cultural values. You have qualified for this project because of your ability to look at human society with cold objectivity, and yet analyze and discuss your observations and conclusions with others of similar intellectual capacity without a loss of discretion or humility. Such virtues are exercised in your own best interest. Do not deviate from them. Silent weapon technology has evolved from Operations Research (O.R. ), a strategic and tactical methodology developed under the military management in England during World War II. The original purpose of Operations Research was to study the strategic and tactical problems of air and land defense with the objective of effective use of limited military resources against foreign enemies (i.e., logistics). It was soon recognized by those in positions of power that the same methods might be useful for totally controlling a society. But better tools were necessary. Social engineering (the analysis and automation of a society) requires the correlation of great amounts of constantly changing economic information (data), so a high-speed computerized data-processing system was necessary which could race ahead of the society and predict when society would arrive for capitulation. Relay computers were too slow, but the electronic computer, invented in 1946 by J. Presper Eckert and John W. Mauchly, filled the bill. The next breakthrough was the development of the simplex method of linear programming in 1947 by the mathematician George B. Dantzig. Then in 1948, the transistor, invented by J. Bardeen, W. H. Brattain, and W. Shockley, promised great expansion of the computer field by reducing space and power requirements. With these three inventions under their direction, those in positions of power strongly suspected that it was possible for them to control the whole world with the push of a button. Engineered in the last half of the decade of the 1940s, the new Quiet War machine stood, so to speak, in sparkling gold-plated hardware on the showroom floor by 1954. With the creation of the maser in 1954, the promise of unlocking unlimited sources of fusion atomic energy from the heavy hydrogen in sea water and the consequent availability of unlimited social power was a possibility only decades away. The combination was irresistible. The quiet war was quietly declared by the international elite at a meeting held in 1954. Although the silent weapons system was nearly exposed 13 years later, the evolution of the new weapon-system has never suffered any major setbacks. Energy is recognized as the key to all activity on earth. Natural science is the study of the sources and control of natural energy, and social science, theoretically expressed as economics, is the study of the sources and control of social energy. Both are bookkeeping systems: mathematics. Therefore, mathematics is the primary energy science. And the book-keeper can be king if the public can be kept ignorant of the methodology of the bookkeeping. All science is merely a means to an end. The means is knowledge. The end is control. Beyond this remains only one issue: Who will be the beneficiary? The objective of economic research, as conducted by the magnates of capital (banking) and the industries of commodities (goods) and services, is the establishment of an economy which is totally predictable and manipulatible. In order to achieve a totally predictable economy, the low-class elements of the society must be brought under total control, i.e., must be housebroken, trained, and assigned a yoke and long-term social duties from a very early age, before they have an opportunity to question the propriety of the matter. In order to achieve such conformity, the lower-class family unit must be disintegrated by a process of increasing preoccupation of the parents and the establishment of government-operated daycare centers for the occupationally orphaned children. The quality of education given to the lower class must be of the poorest sort, so that the moat of ignorance isolating the inferior class from the superior class is and remains incomprehensible to the inferior class. With such an initial handicap, even bright lower Class individuals have little if any hope of extricating themselves from their assigned lot in life. This form of slavery is essential to maintaining some measure of social order, peace, and tranquility for the ruling upper class. Everything that is expected from an ordinary weapon is expected from a silent weapon by its creators, but only in its own manner of functioning. It shoots situations, instead of bullets; propelled by data processing, instead of a chemical reaction (explosion); originating from bits of data, instead of grains of gunpowder; from a computer, instead of a gun; operated by a computer programmer, instead of a marksman; under the orders of a banking magnate, instead of a military general. It makes no obvious explosive noises, causes no obvious physical or mental injuries, and does not obviously interfere with anyone’s daily social life. Yet it makes an unmistakable “noise,” causes unmistakable physical and mental damage, and unmistakably interferes with daily social life, i.e., unmistakable to a trained observer, one who knows what to look for. The public cannot comprehend this weapon, and therefore cannot believe that they are being attacked and subdued by a weapon. The public might instinctively feel that something is wrong but because of the technical nature of the silent weapon, they cannot express their feeling in a rational way, or handle the problem with intelligence. Therefore, they do not know how to cry for help, and do not know how to associate with others to defend themselves against it. When a silent weapon is applied gradually, the public adjusts/adapts to its presence and learns to tolerate its encroachment on their lives until the pressure (psychological via economic) becomes too great and they crack up. What Mr. Rothschild had discovered was the basic principle of power, influence, and control over people as applied to economics. That principle is “when you assume the appearance of power, people soon give it to you.” Mr. Rothschild had discovered that currency or deposit loan accounts had the required appearance of power that could be used to induce people (inductance, with people corresponding to a magnetic field) into surrendering their real wealth in exchange for a promise of greater wealth (instead of real compensation). They would put up real collateral in exchange for a loan of promissory notes. Mr. Rothschild found that he could issue more notes than he had backing for, so long as he had someone’s stock of gold as a persuader to show to his customers. Mr. Rothschild loaned his promissory notes to individuals and to governments. These would create overconfidence. Then he would make money scarce, tighten control of the system, and collect the collateral through the obligation of contracts. The cycle was then repeated. These pressures could be used to ignite a war. Then he would control the availability of currency to determine who would win the war. That government which agreed to give him control of its economic system got his support. Collection of debts was guaranteed by economic aid to the enemy of the debtor. The profit derived from this economic methodology made Mr. Rothschild all the more able to extend his wealth. He found that the public greed would allow currency to be printed by government order beyond the limits (inflation) of backing in precious metal or the production of goods and services (gross national product, GNP). In this structure, credit, presented as a pure element called “currency” has the appearance of capital, but is, in fact, negative capital. Hence, it has the appearance of service, but is, in fact, indebtedness or debt. It is therefore an economic inductance instead of an economic capacitance, and if balanced in no other way, will be balanced by the negation of population (war, genocide). The total goods and services represent real capital called the gross national product, and currency may be printed up to this level and still represent economic capacitance; but currency printed beyond this level is subtractive, represents the introduction of economic inductance, and constitutes notes of indebtedness. War is therefore the balancing of the system by killing the true creditors (the public which we have taught to exchange true value for inflated currency) and falling back on whatever is left of the resources of nature and regeneration of those resources. Mr. Rothschild had discovered that currency gave him the power to rearrange the economic structure to his own advantage, to shift economic inductance to those economic positions which would encourage the greatest economic instability and oscillation. The final key to economic control had to wait until there was sufficient data and high-speed computing equipment to keep close watch on the economic oscillations created by price shocking and excess paper energy credits – paper inductance/inflation. [To apply] the method of airframe shock testing to economic engineering, the prices of commodities are shocked, and the public consumer reaction is monitored. The resulting echoes of the economic shock are interpreted theoretically by computers and the psycho-economic structure of the economy is thus discovered. It is by this process that partial differential and difference matrices are discovered that define the family household and make possible its evaluation as an economic industry (dissipative consumer structure). Then the response of the household to future shocks can be predicted and manipulated, and society becomes a well-regulated animal with its reins under the control of a sophisticated computer-regulated social energy bookkeeping system. Eventually every individual element of the structure comes under computer control through a knowledge of personal preferences, such knowledge guaranteed by computer association of consumer preferences (universal product code – UPC – zebra-stripe pricing codes on packages) with identified consumers (identified via association with the use of a credit card and later a permanent “tattooed” body number invisible under normal ambient illumination). The Harvard Economic Research Project (1948–) was an extension of World War II Operations Research. Its purpose was to discover the science of controlling an economy: at first the American economy, and then the world economy. It was felt that with sufficient mathematical foundation and data, it would be nearly as easy to predict and control the trend of an economy as to predict and control the trajectory of a projectile. Such has proven to be the case. Moreover, the economy has been transformed into a guided missile on target. The immediate aim of the Harvard project was to discover the economic structure, what forces change that structure, how the behavior of the structure can be predicted, and how it can be manipulated. What was needed was a well-organized knowledge of the mathematical structures and interrelationships of investment, production, distribution, and consumption. To make a short story of it all, it was discovered that an economy obeyed the same laws as electricity and that all of the mathematical theory and practical and computer know-how developed for the electronic field could be directly applied in the study of economics. This discovery was not openly declared, and its more subtle implications were and are kept a closely guarded secret, for example that in an economic model, human life is measured in dollars, and that the electric spark generated when opening a switch connected to an active inductor is mathematically analogous to the initiation of a war. The greatest hurdle which theoretical economists faced was the accurate description of the household as an industry. This is a challenge because consumer purchases are a matter of choice which in turn is influenced by income, price, and other economic factors. This hurdle was cleared in an indirect and statistically approximate way by an application of shock testing to determine the current characteristics, called current technical coefficients, of a household industry. Finally, because problems in theoretical economics can be translated very easily into problems in theoretical electronics, and the solution translated back again, it follows that only a book of language translation and concept definition needed to be written for economics. The remainder could be gotten from standard works on mathematics and electronics. This makes the publication of books on advanced economics unnecessary, and greatly simplifies project security. The problem with stabilizing the economic system is that there is too much demand on account of (1) too much greed and (2) too much population. This creates excessive economic inductance which can only be balanced with economic capacitance (true resources or value – e.g., in goods or services). The social welfare program is nothing more than an open-ended credit balance system which creates a false capital industry to give nonproductive people a roof over their heads and food in their stomachs. This can be useful, however, because the recipients become state property in return for the “gut,” a standing army for the elite. For he who pays the piper picks the tune. The means of surviving the reaction is by changing the system before the reaction can return. By this means, politicians become popular in their own time and the public pays for it later. In fact, the measure of such a politician is the delay time. The same thing is achieved by a government by printing money beyond the limit of the gross national product, an economic process called inflation. This puts a large quantity of money into the hands of the public and maintains a balance against their greed, creates a false self-confidence in them and, for awhile, stays the wolf from the door. They must eventually resort to war to balance the account, because war ultimately is merely the act of destroying the creditor, and the politicians are the publicly hired hit men that justify the act to keep the responsibility and blood off the public conscience. The latter option has been taken as the obviously better option. The primary reason why the individual citizens of a country create a political structure is a subconscious wish or desire to perpetuate their own dependency relationship of childhood. Simply put, they want a human god to eliminate all risk from their life, pat them on the head, kiss their bruises, put a chicken on every dinner table, clothe their bodies, tuck them into bed at night, and tell them that everything will be alright when they wake up in the morning. This public demand is incredible, so the human god, the politician, meets incredibility with incredibility by promising the world and delivering nothing. So who is the bigger liar? the public? or the “godfather”? This public behavior is surrender born of fear, laziness, and expediency. It is the basis of the welfare state as a strategic weapon, useful against a disgusting public. Most people want to be able to subdue and/or kill other human beings that disturb their daily lives, but they do not want to have to cope with the moral and religious issues which such an overt act on their part might raise. Therefore, they assign the dirty work to others (including their own children) so as to keep the blood off their own hands. They rave about the humane treatment of animals and then sit down to a delicious hamburger from a whitewashed slaughterhouse down the street and out of sight. But even more hypocritical, they pay taxes to finance a professional association of hit men collectively called politicians, and then complain about corruption in government. Most people want to be free to do things but they are afraid to fail. The fear of failure is manifested in irresponsibility, and especially in delegating those personal responsibilities to others where success is uncertain or carries possible or created liabilities (law) which the person is not prepared to accept. They want authority (root word – “author”), but they will not accept responsibility or liability. So they hire politicians to face reality for them. The people hire the politicians so that the people can: (1) obtain security without managing it. (2) obtain action without thinking about it. (3) inflict theft, injury, and death upon others without having to contemplate either life or death. (4) avoid responsibility for their own intentions. (5) obtain the benefits of reality and science without exerting themselves in the discipline of facing or learning either of these things. They give the politicians the power to create and manage a war machine to: (1) provide for the survival of the nation/womb. (2) prevent encroachment of anything upon the nation/womb. (3) destroy the enemy who threatens the nation/womb. (4) destroy those citizens of their own country who do not conform for the sake of stability of the nation/womb. Politicians hold many quasi-military jobs, the lowest being the police which are soldiers, the attorneys and the CPAs next who are spies and saboteurs (licensed), and the judges who shout the orders and run the closed union military shop for whatever the market will bear. The generals are industrialists. The “presidential” level of commander-in-chief is shared by the international bankers. Few efforts of human behavior modification are more remarkable or more effective than that of the socio-military institution known as the draft. A primary purpose of a draft or other such institution is to instill, by intimidation, in the young males of a society the uncritical conviction that the government is omnipotent. He is soon taught that a prayer is slow to reverse what a bullet can do in an instant. Thus, a man trained in a religious environment for eighteen years of his life can, by this instrument of the government, be broken down, be purged of his fantasies and delusions in a matter of mere months. Once that conviction is instilled, all else becomes easy to instill. Even more interesting is the process by which a young man’s parents, who purportedly love him, can be induced to send him off to war to his death. One online version shows the diagrams that are in our original pamphlet: http://land.netonecom.net/tlp/ref/sw4qw/index.shtml. Hartford Van Dyke has been released from federal prison in 2011 and is home doing well. This was an interesting read, but is nothing new, to really start helping each other there needs to be skilled articifers who reciprocate those skills to each other in need. Help those who want to help themselves basically, because the so called mind doctors are incapable of doing that, until such time it is them needing assistance. if we continue to reley on the minds and models written out by stories like this one, they will simply stand back after throwing the rocks at the hornets nest, that the majority are standing next to, whilst the catapulters at a safe distance to observe the outcome, when its all over they move in, pick up the pieces and assets, then plant new seeds with they know will take root after they have watered them. Basically we are being farmed by very clever farmers, Google the title, Human Farming, for a better picture. Interest and inflation free money by Margarit Kennedy. THE “SILENT WEAPONS FOR QUIET WARS HOAX” AND “THE REPORT FROM IRON MOUNTAIN HOAX EXPLAINED” !!!!!!!!!!!!!!! The promoter falsely claims that the document entitled, “Silent Weapons For Quiet Wars”, is a “secret” government document which proves that the United States government is actually using “silent weapons” in a “quiet war” against the American people. Likewise, the promoter also falsely claims that “The Report Form Iron Mountain” is a “secret” and/or “leaked” government document which proves that the United States government is waging a secret war against the American people by nefarious and alternative means. But, none of this is so. The document entitled, “Silent Weapons For Quiet Wars”, is NOT what the promoter claims it is, was NOT written by the United States government and does NOT reflect that the United States government is secretly waging a “quiet war” against the American people. Likewise, the book “The Report From Iron Mountain” is NOT what the promoter claims it is, was NOT written by the United States government and does NOT reflect that the United States is waging a secret war against the American people by nefarious and alternative means. 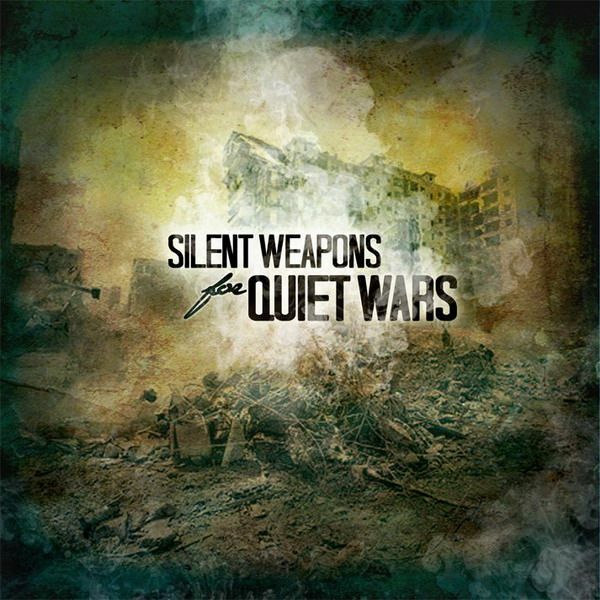 “Silent Weapons For Quiet Wars” is actually a document of fiction that was written as a political commentary to illustrate a political point. It was actually written by Lyle Hartford Van Dyke, the son of a WWII military officer who claimed (perhaps even correctly) that the United States had advance knowledge of the attack upon Pearl Harbor and allowed it to happen to draw us into war. “Silent Weapons For Quiet Wars” was NOT written by the United States government. More recently, Lyle Hartford Van Hartford became an amateur legal theorist, sought to pay debts by using FAKE checks drawn on his imaginary account at the United States Treasury and spent a number of years in federal prison. “Silent Weapons For Quiet Wars” was inspired by, and loosely based upon a similar 1960’s New York Times Best Selling Book for “Fiction” entitled, “Report From Iron Mountain”, by Leonard Lewin, another book of fiction that was written as a political commentary to illustrate a political point. It was NOT written by the government either. Both books are written as if they could have been government documents to help illustrate their political points. The promoter of the “Silent Weapons For Quiet Wars Hoax” and the “Report From Iron Mountain Hoax” is well aware of the truth about these two documents, but she nevertheless continues to falsely tell the American people that they are “secret” or “leaked” government documents anyway, in order to frighten and horrify them, something from which she derives great power, importance, pleasure and satisfaction. This same promoter, her partner in these hoaxes and amateur legal theorist, “Rodney DALE Class”, are the same three people who brought you the “Judge DALE Hoax” which involves the online publishing of FAKE conspiratorial legal articles that reveal FAKE conspiratorial legal information which were written by a FAKE “(an non-existent) retired federal judge” named, “Judge DALE” (which uses Rodney DALE Class’ middle name, “DALE”, as an inside joke). Among these “Judge DALE forgeries” that were fabricated by these three people are, “The Matrix And The US Constitution” (2010), “The Great American Adventure: Secrets of America” (2012) and “Lawfully Yours: A People’s Empowerment Guide” (2014). As hard as it is to believe, the promoter and her partner in these forgeries STILL peddle these FAKE, FORGED, FRAUDULENT documents from their own personal websites despite that EVERYONE knows that they are entirely FAKE. This same promoter and her partner also brought you the “NASA War Document Hoax”, the “FAKE Jim Traficant Speech Hoax”, the “Bar Card Hoax”, the “Court Registry Investment Systems Hoax” and numerous other hoaxes all of which were designed and intended to incite hatred and violence against all of the legal and governmental institutions of the American people. The promoter and her partner do not lie to people for whom they have respect. They only lie to people for whom they have no respect. The series of lies reflected by all of these hoaxes speak volumes about what the promoter, her partner and Rodney DALE Class really think of the American people. http://redcatsboards.yuku.com/topic/8216/Fraud-artists-sentenced-to-prison#.WDYUm1KFPIU . http://www.plainsite.org/dockets/4wu515xw/oregon-district-court/usa-v-nolan-et-al/ . http://www.plainsite.org/dockets/4wu65fma/oregon-district-court/usa-v-nolan-et-al/ . GO TO PACER.GOV. See all five LOSES filed under the name “Van Dyke, Lyle” and “Van Dyke. Lyle Hartford”. Snoop4truth did not expose the “Silent Weapons For Quiet Wars Hoax”, “The Report From Iron Mountain Hoax” or the “NASA War Document Hoax” to harm the promoter or her partner. Instead, Snoop4truth exposed these despicable hoaxes solely to reduce the catastrophic damage that such intentional disinformation inflicts upon the American people every single day. Had it not been for the promoter’s role in the “Judge DALE Hoax”, Snoop4truth would not have exposed the “Silent Weapons For Quiet Wars Hoax” or “The Report From Iron Mountain Hoax” here. Just curious who attributed it to HVD? I read the “letter” he wrote Paranoia Mag, and I also read that PM was “confident” he was the author. Why? Because I must say that the “elite” has lost their right to a benefit of doubt a long time ago. In fact, the opposite is true: If I can conceive a scheme, there probably is one. And using that reverse deduction, I see no reason why this guy couldn’t/wouldn’t be made to fit the equation and coached. I’m sure the Federal penitentiaries are loaded with “lawbreaking’ activists, who have written stuff, who were given plenty of time to think since the 70’s..when they were young and high, and would say anything for a break. Frankly, when comparing it to his his handful of other, mildly similar yet less specific and detailed, less “technically advanced” writings, I have to say it supports that theory more than enough for me. THE “SILENT WEAPONS FOR QUIET WARS HOAX” & “THE REPORT FROM IRON MOUNTAIN HOAX” !!!!!!!!!!!!!!!!!!!!!!!!!!!!!!!!!!!!!!!!!!!!!!!!!!!!!!!!!!!!!!!!!!!!!!!!!!!!!!!!!!!!!!!!!!!!!!!!!!!!!!!!!!!!!!!!!!!!!!!!!!!!!!!!!!!!!!!!!!!!!!!!!!!!!!!!!!!!!!!!!!!!!!!!!!!!!!!!!!!!!!!!!!!!!!!!!! THE HOAXES: The promoter of these two hoaxes falsely claims that the document entitled, “Silent Weapons For Quiet Wars” “(“SWFQW”) is a “secret” government document which proves that the United States (“U.S.”) government is actually using “silent weapons” in a “quiet war” against the American people. Likewise, the promoter of these two hoaxes also falsely claims that “The Report Form Iron Mountain”(“TRFIM”) is another “secret” and/or “leaked” and/or “suppressed” government document which proves that the U.S. government is tricking the American people with fake wars. But, none of this is so. “SWFQW” was a POLITICAL SPOOF written by Lyle Hartford Van Dyke. Van Dyke believed that the U.S. had advance knowledge of the Japanese attack on Pearl Harbor and allowed it to happened in order to draw the U.S. into World War II. Van Dyke was outraged by this treasonous act of war by the U.S. upon its own soldiers and wanted to make the HORRORS of this treasonous act of war PERSONAL to the American public. So, Van Dyke wrote SWFQW and suggested that instead of intentionally killing its own soldiers in such an act of war, the U. S. government was instead INTENTIONALLY KILLING ITS OWN CIVILIAN POPULATION in such an act of war (a clever twist of the facts). But, Van Dyke realized that the public would not actually believe his premise (of a U.S. war against the public) without the presence of the usual weapons of war (armed soldiers, trucks, tanks, planes, missiles, bombs, etc.). So, in SWFQW, Van Dyke suggested that all of the weapons that the U.S. was using in this imaginary war against the American public COULD NOT BE SEEN OR HEARD. This being the case, the reader could not dispute Van Dyke’s claims (of INVISIBLE & INAUDIBLE weapons), which actually made his claims MORE (not less) BELIEVABLE. By using this ruse, VAN DYKE ACTUALLY MADE THE APPARENT ABSENCE OF WEAPONS EVEN MORE HORRIFYING TO THE READER THAN THEIR PRESENCE WOULD HAVE BEEN. It was absolutely brilliant. Van Dyke incorporated sections of REAL scientific and economic studies into his work and created it to read like an official governmental document in order to make the threat of the U.S. government waging a covert war against its own citizens appear more real and therefore more terrifying to the reader. It worked. TRFIM was another POLITICAL SPOOF written by Leonard C. Lewin which was so popular and so widely read that it actually made the New York Times Best Seller List in the 1960’s. (So much for the promoter’s “secret”, “leaked” or “suppressed” document story.). Lewin was critical of U.S. government policy because the U.S. had been in an almost perpetual state of war for decades and because the U.S. economy was too dependent upon military spending. In criticizing U.S policy, Lewin SARCASTICALLY observed that U.S. policy makers must have believed that “the U.S. could not afford peace” (meaning that if the U.S was not at war, the U.S. government and the U.S. economy might actually collapse). Lewin sought to make a MOCKERY of U.S. policy and the ABSURDITY of the beliefs apparently underlying it, so in TRFIM he took both to their logical extremes. In writing TRFIM, Lewin pretended to be an imaginary committee of the U.S. government which reported to U.S. policy makers that the U.S. was so dependent on perpetual war that if the U.S. ever found itself at peace, IT WOULD ACTUALLY BE FORCED TO CREATE FAKE WARS (called “credible substitutes”) to prop up the U.S. government and the U.S economy. Specifically, Lewin, while pretending to be an imaginary committee of the U.S. government SARCASTICALLY suggested to U.S. policy makers that if the U.S. ever found itself at peace, it could create FAKE WARS against FAKE alien life forms and against FAKE environmental calamities. It was absolutely brilliant. Lewin created TRFIM to read like an official report of a committee of the U.S. government IN ORDER TO EMBARRASS U.S. MAKERS WHO SUPPORTED PERPETUAL WAR. It worked. As proof that Lewin is the real author of TRFIM, when an unauthorized publisher re-published his book without his permission, he sued the publisher and won, something that would have been impossible if the book had actually been written by a committee of the U. S. government as the promoter falsely claims. (See links below.). WHAT VAN DYKE HAS TO SAY ABOUT HIS OWN DOCUMENT. VAN DYKE AS AN AMATEUR LEGAL THEORIST. http://redcatsboards.yuku.com/topic/8216/Fraud-artists-sentenced-to-prison#.WDYUm1KFPIU . http://www.plainsite.org/dockets/4wu515xw/oregon-district-court/usa-v-nolan-et-al/ . http://www.plainsite.org/dockets/4wu65fma/oregon-district-court/usa-v-nolan-et-al/ . GO TO PACER.GOV. See all five LOSES filed under the name “Van Dyke, Lyle” and “Van Dyke. Lyle Hartford”. THE TRUTH ABOUT THE REPORT FROM IRON MOUNTAIN. The promoter is a professional hoaxer and charlatan. She has always known that both SWFQW and TRFIM were two harmless documents of political FICTION. But, she nevertheless told the American people they were “secret”, “leaked” or “suppressed” government documents anyway (in order to fraudulently incite hatred and violence against the ELECTED representatives of “We the People” and their appointees). Unfortunately, these two hoaxes (described above) are not the only hoaxes that this promoter inflicts upon the American people. They are but a very small part of a much larger pattern of fraud. This same promoter, her co-conspirator in these two hoaxes (described above) and amateur legal theorist, “Rodney DALE Class”, are the same three charlatans who brought you the “Judge DALE Hoax” in which they distributed FAKE “legal” books which revealed FAKE legal information WHICH THEY THEMSELVES ACTUALLY CREATED, but which they fraudulently told the American people were written by a FAKE “retired federal judge” named, “Judge DALE” (which uses Rodney DALE Class’ middle name, “DALE”, as an inside joke). As hard as it is to believe, the promoter and her co-conspirator in the “Judge DALE Hoax” STILL peddle all three of these FORGERIES from their own personal websites, despite that EVERYONE KNOWS THEY ARE ENTIRELY FAKE. (And, speaking of “MATRIX” hoaxes, for more “MATRIX” hoaxes by the very same charlatans, go to: https://www.youtube.com/watch?v=ts7CejgSkjc&t=22s (Go to this video FIRST. Then, go to :30-:45 for an ACTUAL PHOTO of “Judge DALE” inside the “MATRIX”); http://www.globaltruth.net/jeff-rense-deborah-tavares-escaping-the-matrix/; https://www.youtube.com/watch?v=sykRuXXNJzU ; https://www.youtube.com/watch?v=HX5IJMevyP8 ; https://www.youtube.com/watch?v=k4eRlBbcFkc.). CLASS’ CO-CONSPIRATORS CAUGHT ON TAPE WHILE ACTUALLY ENGAGED IN THE THE “JUDGE DALE HOAX”. (Jeff Rense is NOT involved in the hoax.). (Do not click on blue numbers below. They link to the wrong video. Instead, go to the following videos FIRST. Then, go to the times indicated below. They are the exact times of the hoax documented therein.). The woman behind this hoax is a well-known, PROFESSIONAL CHARLATAN AND HOAXER. She does nothing but create, manufacture and publish online hoaxes. She has long engaged in a pattern of FORGING FAKE, COUNTERFEIT documents and FRAUDULENTLY attributing those FORGERIES to others (like the federal government or its agencies). When not FORGING her own FAKE, COUTERFEIT documents for that purpose, she takes documents written by others THAT SHE KNOWS TO BE POLITICAL “FICTION” and FRAUDULENTLY tells her unsophisticated followers that they are REAL documents written by “GOVERNMENT INSIDERS” who are “IN THE KNOW”. All of the claims made by this woman are intended to incite hatred and violence against the ELECTED representatives of “We the People” and our Republican form of government. This CHARLATAN is behind ALL THREE of the “Judge DALE forgeries” (all of which she co-wrote with Rod Class), including “The Matrix And The US Constitution” (2010), The Great American Adventure: Secrets of America” (2012) & “Lawfully Yours” (2014), the “Judge DALE Hoax” (with Rod Class), the “All Government Agencies Are ‘Private Entities’ [or ‘Private Contractors’] Hoax” (with Rod Class), the “Property Into Other Names Hoax” (with Rod Class), the “Court Registry Investment System Hoax” (with Rod Class), the “Federal Government Is A Private, For-Profit Corporation Hoax” (with Rod Class), the “B.A.R. Card Hoax” (with Rod Class), the “‘Esquire’ Is AN INHEREITED TITLE For Those Born Of NOBLE BLOOD Hoax” (with Rod Class), the “British Accreditation Registry Hoax [B.A.R. Hoax]” (with Rod Class), the “NASA War Document Hoax”, the “Silent Weapons For Quiet Wars Hoax”, the “Report From Iron Mountain Hoax”, the “FAKE Jim Traficant Speech Hoax” and numerous other hoaxes, all of which she uses to INTENTIONALLY DEFRAUD the American people. .
Rod Class is a functionally-illiterate amateur legal theorist with barely a high school education WHO HAS LOST EVERY SINGLE CASE IN WHICH HE HAS EVER BEEN INVOLVED (OVER 73 CONSECUTIVE LOSSES IN A ROW, AND STILL COUNTING). Further, Class has a long history of PSYCHIATRIC PROBLEMS involving DELUSIONS, PATHOLOGICAL OPPOSITION/DEFIANCE of AUTHORITY FIGURES and PATHOLOGICAL LYING. Moreover, Class is a MULTI-CONVICTED, WEAPONS RELATED, CONVICTED FELON who also has SEVERAL MISDEMEANOR CONVICTIONS as well. Because of Class’ well-publicized HATRED of our ELECTED representatives, their appointees and our REPUBLICAN form of government, because of his HISTORY OF PSYCHIATRIC PROBLEMS and because of his CRIMINAL HISTORY involving DEADLY WEAPONS, Class has been placed on the United States TERRORIST WATCH LIST. Most importantly, Class is a PROFESSIONAL HOAXER AND CHARLATAN who is behind a number of legal HOAXES which he created and peddles to INTENTIONALLY DEFRAUD the American people. Snoop4truth is a legal expert and whistle blower who exposes online hoaxes. Snoop4truth did not expose this hoax to harm Rod Class. Instead, Snoop4truth exposed this hoax solely to reduce the catastrophic damage that such intentional fraud inflicts upon the American people every single day. Had it not been for Rod Class’ role in the “Judge DALE Hoax”, Snoop4truth would not have exposed this hoax here. The message? Just tell the truth.